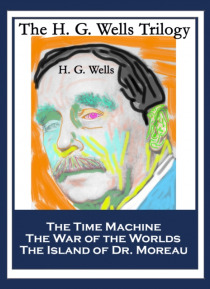 H. G. Wells was one of the most influential science fiction writers of all times. His three most important novels The Time Machine, The War of the Worlds, and The Island of Dr. Moreau still seem as fresh today as when he first wrote them. The Time Machine explores human nature. The Time Traveler finds himself in 802,701 A.D., where he meets the peaceful Eloi and encounters the violent Morlocks. We… lls uses these two descendants of man to explore evil and its causes, drawing conclusions that might surprise you in this riveting tale that has stood the test of time. This deluxe edition has the deleted portion of chapter eleven that ran in the original serialization, but was removed by Wells for book publication; it runs after the story as the "e;Gray Man. "e; In addition to the "e;Gray Man"e; this edition also contains the full text of "e;The Chronic Argonauts"e; Wells' first time travel story which he borrows liberally from for The Time Machine. In War of the Worlds Mankind finds itself in a fight for its very survival when invaders from Mars land on Earth. Using their vastly superior technology the Martians make short order of all the great powers of Earth, laying waste to everything in their path. The novel follows an unnamed man as he flees for his life while trying to locate his wife in the shattered ruins of Earth. Powerful and insightful. Island of Doctor Moreau: Edward Prendick finds himself adrift at sea, a lone survivor of a ship wreck. He spends more than a week drifting without food or water. Pendrick consigns himself to death, but fate intervenes and delivers him to an unknown Island. The terrors that await him on Doctor Moreau's island are far worse than what he has just been rescued from or anything that he could imagined.